Now she is in her second year of her Acupuncture course at LSBU. Tess had been interested in acupuncture since she first lived in Hong Kong in 1996 and started receiving traditional Chinese medicine alongside Western medicine. She also studied tai chi for many years, which Tess sees as going hand in hand with how the ancient Chinese promoted health. These factors meant she decided she wanted to change career direction and pursue acupuncture. However, she had trouble finding a course that would fit around her already busy life until she came across LSBU. "As a mature student, my studies have to fit in with work and family and LSBU's ability to deliver lectures on weeknights and weekends works very well for me. Being a mature student, I don't have the typical undergraduate experience. My time is precious so I am only in campus for lectures, clinics and research." Tess is focussed on making sure the course readies her to be the best she can in a clinical environment, and the way the course is taught helps facilitate that. "All the lectures, seminars and research boil down to one thing – being able to bring all the knowledge together when I am in clinic. Being a student observer first, then a student practitioner will always be the highlight of the course." 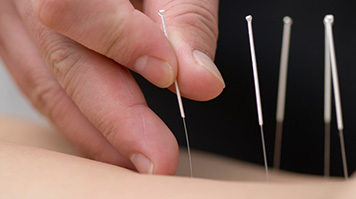 "In London, LSBU has the only university acupuncture programme that is fully accredited by the British Acupuncture Accreditation Board and caters for working students. Its partnership with the Confucius Institute for Traditional Chinese Medicine was important in my decision to come here too. This makes it possible for the acupuncture students to study, observe and practice in the partner Chinese university in Harbin in the autumn of our fourth year." Tess found the diverse group of lecturers – both from British and Chinese backgrounds with plenty of experience in acupuncture, to be incredibly beneficial. This approach means students learn a range of different techniques, all of which can be useful clinical settings after graduation. Although Tess admits to not spending as much time engaged in extracurricular activities available to LSBU students due to time constraints, she has found that many do. "We are a cohort of thirteen students and many are also mature students. It is my privilege to be in a group that is so stimulating, supportive, entertaining and like-minded. "After graduating, Tess is in no doubts as to what she wants to do. She plans to set up an acupuncture practice as soon as possible.